As visible from these stats the company is very cheap on an asset basis, while the metrics for profitability are not very meaningful since the company posted a small loss for the trailing twelve months. With Webco trading at 60% of net current asset value the company is trading below the famous 66% number that Benjamin Graham popularized as a threshold for buying cheap value stocks. It’s a stock worth investigating, but it’s clear that the profitability of the business is an aspect that needs closer scrutiny. As is (unfortunately) common for unlisted microcaps the amount of disclosure provided in the quarterly and annual reports is limited (actually calling it a report is a bit of a stretch). But the most important information is there, and the upside is that it’s easy to get a good high-level overview of how the business has performed historically. In the graph below I have plotted the development of EPS, BV/s and NCAV/s (note that 2016 is the third quarter or the TTM) . As you can see Webco’s business is quite cyclical, earnings per share were as high as $31.99 in 2011 while dropping to negative $1.76 for the trailing twelve months. With the stock trading at $51 the market is obviously discounting the possibility of getting those peak earnings back anytime soon. Since the average earnings have been quite poor since 2008 I think that is the right viewpoint. In the article linked earlier the company boasts that they have achieved almost 10% growth since 1969 which I think is an okay result, but nothing more than that (and the question is what kind of metric that is, it’s probably equity and not equity/share). Since 2008 equity has growth at a significantly slower rate of just 4.89% annually, and because the number of shares outstanding is slowly increasing as well the growth in equity/share is even lower. Shares outstanding have grown with just 0.86% per year since 2008 and as a result the growth of equity/share is just 4.00%. The difference between 4.89% and 4.00% isn’t that big on an absolute basis, but at the same time it means that management got approximately 20% of the profits of the company as share based payments while the operational performance was poor. There is not enough disclosure to know how high the base salaries were. One thing that should jump out from these financials is the amount of debt that the company is employing and how the amount of net debt has dropped quickly in the past three quarters from $75 million to $40 million. This is still a lot compared to the market cap of the company, but I think the amount should be manageable. Webco has a positive working capital of $115 million that presumable could be converted to cash relatively quickly in a liquidation scenario, and there is $91 million of PP&E on the balance sheet. Presumable some of this PP&E includes land and buildings that are recorded at historical cost while their value has grown through time. 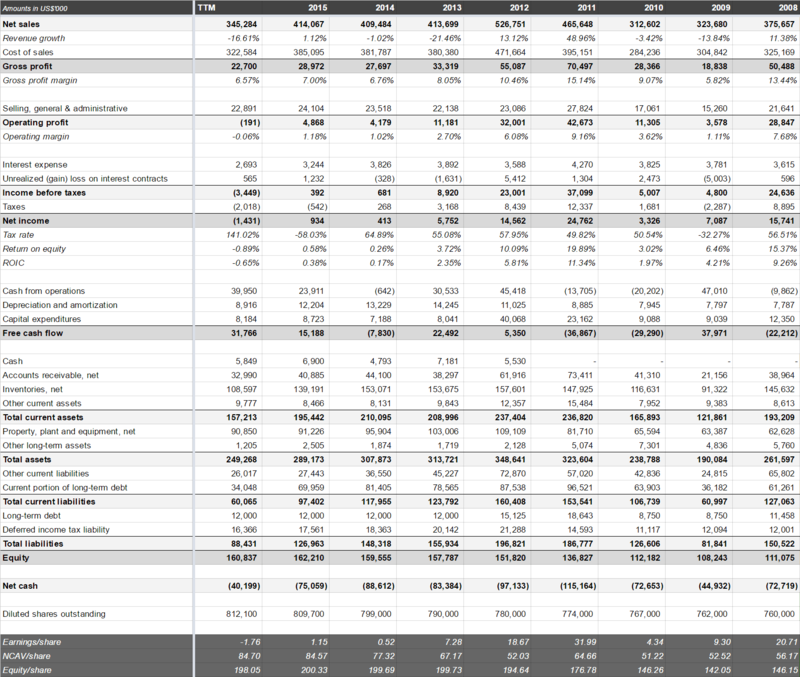 Also noteworthy are the lines from the cash flow statement. As visible the company spend a lot of money in 2011 and 2012 on a new factory which in hindsight looks like a big mistake since they expanded right at the top of the cycle. The most recent years the amount of capital expenditures are a lot lower, and depreciation is actually higher than capex which is good for the cash flow generation of the business. But when we look at all the years since 2008 the net amount of free cash flow that is generated is very poor since most of the cash from operations is spend on capex. Perhaps most of it was growth capex that can still payoff when the industries that Webco serves switch to a higher gear, but for now it just looks like wasted money. There are multiple ways to value Webco, and the big question is what is the most relevant one. You can for example look at liquidation value, current earnings power, average historical earnings power or even the value of the company as an acquisition candidate. 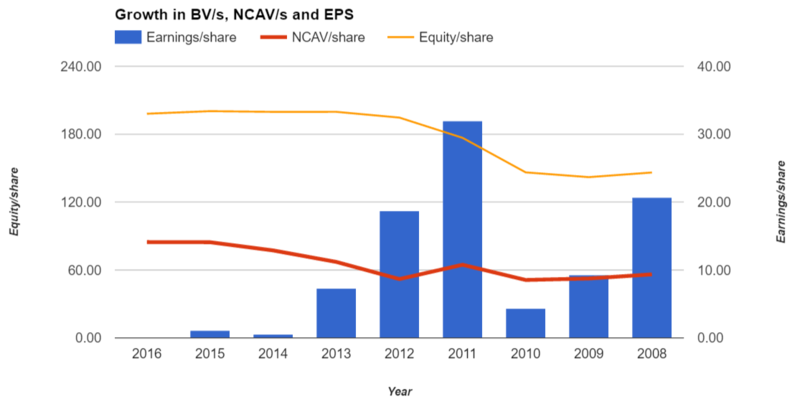 With the stock trading at just 60% of NCAV it’s intuitively clear that looking at liquidation value would yield a positive picture. You could even argue that in a liquidation scenario the deferred income tax liability would disappear since the company would record massive losses if all long term assets would be valued at zero (which you do when you look at just NCAV). NCAV/share plus the tax liability would give us a value of $104.75/share: a little bit more than 100% upside. Harmon described, “Our mission statement can be summed up as we are a ‘forever kind of company’, and that’s the way we’ve always operated. We make decisions based upon the long term rather than what’s going to happen this quarter or next quarter.” This focus on long-term viability has driven significant investment in facilities, technology and product development. Assuming that the company will continue operating as is seems therefore a good assumption. I think that investor in a company like this should roughly demand that they will grow their equity with 10%/year on average. This corresponds to a 10x P/E-ratio (when the amount of outstanding shares remains static). Because Webco has grown equity/share at a 4% rate since 2008 it basically means that the fair value of the company is a 0.40x P/B ratio. This is pretty cheap, but at the same time it still means we have 55% upside. One factor that can possibly explain the low share price of Webco (besides the fact that it is unlisted, small and illiquid) is the fact that the Wells Fargo Small Cap Value Fund has been a consistent seller of the stock since 2015. The fund reduced their position from 81,000 shares in 2014 to 55,400 shares in 2015 and this year so far they have reduced their position with another 15,300 shares. That doesn’t sound like a lot, but for a company that has a trading volume of just a few thousand shares on most months that is a significant selling pressure. With 40,100 shares left the fund is still a big holder with a 4.9% stake in Webco, but thanks to the article on Value Investors Club trading volumes have increased and it should provide an opportunity for the fund to exit their whole stake relatively quickly. Webco Industries is not a great business. Returns on equity have been low on average, the share count is slowly growing despite mediocre performance, free cash flow is low because earnings are plowed back in the company and the disclosure of relevant information to investors is poor. Despite all these factors I think that at the current price an investment in the company is warranted. With a 4% historical growth rate of equity/share you basically buy an equity yielding 15.4% at the current price. While I don’t expect anything spectacular to happen with Webco anytime soon, this is also the kind of stock that at some point in the future could suddenly become worth a lot more. The Weber family might for example want to monetize their stake in the company, and for an acquirer I can imagine that this company is worth close to book value. It might not happen this year, next year or even next decade, but you get a bit of optionality on a very positive surprise. This entry was posted in Portfolio and tagged WEBC on September 20, 2016 by Alpha Vulture.